I am planning to work through each of the crossed structure bindings now. Arregui details seven different ways to make a crossed structure binding and I have only tried two of these. The one that I use most is the Crossed Structure Binding Basic (CSB Basic). So I have done this a hundred times but I went to Arregui's website to see the instructions again and discovered that it isn't so basic. She actually shows how to do the CSB Basic with three different sewings. So I did all three. And surprisingly, the way I usually sew them wasn't included so I did that too, resulting in four different books just to cover this one binding! One big difference between this CSB and the others, is that the front and back covers are cut at the same time. For all the other CSBs, the covers are cut separately. I started with this template and used it for all the books, in four different colours. 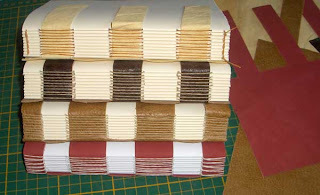 I have always used the 3 inside strips for sewing but discovered that Arregui also shows how to sew the book using the other 4 strips. This makes an obvious impact on the appearance of the finished book. So I sewed two of these books on 3 strips, and two on 4 strips. And all four books are actually sewn a bit differently, one of each using kettle stitches and one with some extra wrapping around the strips...Arregui says this can be good in thick books to keep a consistent swell. Not necessary for my books but I did one like it anyway. Then I just had to attach the front covers and I have four very different books all made using the CSB Basic instructions. I like the alternate sewing on four strips and it seems to make the spine a bit sturdier...CSB Protective comes next. Rhonda, your concentration on your structures is always impressive (and inspiring). Lovely work, as always. Oh yes, structure structure! Doesn't everyone spend their time considering whether or not they want to use a kettle stitch? or sew on 3 tapes or 4? i think they look great! :D and the pink one is really cute! hi rhonda, your CSBs are great, I'm following your workthrough with great interest and am already looking forward to the Marcopolo style which I find very beautiful! question: when working the strips under the covers, don't they "rise" on the even surface on the cover's inside? I mean, when the inside is uneven, it's quite hard to write, isn't it? thanks tulibri. You're right, the strips of leather can create bumps that might make writing a bit difficult, especially if the cover material is thick. Often I use very thin leather, then line it on the inside with Japanese paper, and the bumps are barely noticeable. I just examined one that I made with thicker leather and it does seem that the bumps would be a problem for writing on the first 15-20 pages. I hadn't considered that before - because I don't write in the journals myself! But I have been thinking about it since you left your comment. I thought of a couple possible solutions. 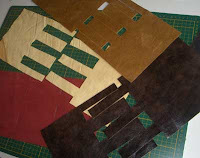 On the inside of the cover, I could fill in the spaces between the straps by pasting a layer of the same leather around the strips thus making the whole surface the same thickness. Or if the leather is really thick, perhaps the straps could be pared down, then grooves hollowed out on the inside of the front cover where the straps will lie. This should result in an even thickness. Also, the covers could be cut to allow for turn-ins - then the covers could be lined with binder's board, the leather would then turn-in all the way around and an endpaper could be pasted down. Now I will have to try some of these things! Rhonda, thanks a lot for these elaborate explanations. I did my very first CSB this week-end, with very solid bonded leather (my first approach to leather at all!) which makes the bump-problem probably more obvious than limp leather. When reading your solutions, it came to my mind that a very simple thing could be to integrate a sheet of cardstock into both ends of the textblock, as a kind of single endsheet. It would work like pad or so, what do you think? tulibri, that sounds like a great idea. Certainly a little simpler than some of the things i had suggested and definitely worth trying! Thanks Rhonda for re-inspiring me to make more books. I had a theft/loss whatever of a whole box of books on their way to a trade show and since then I just didn't feel like making any books. I think your blogsite has got me going again. Thank you for that.